Well I have thought about the colonial, and I am still working on it, but I have considered a little update to the roof line. So I did a quick sketch edit, and I am not real good with MS draw, so it is a dirty edit, but I think it shows where I am headed. I will be doing the edit in Google Sketch-up soon, and that will be published to show the updates. I have some additional updates coming, as I am starting the foundation build in Google Sketch-up. It is going to be built on a pier foundation, though it could be built on any foundation. I also will have a lot of window and door details that are not present in the sketch. 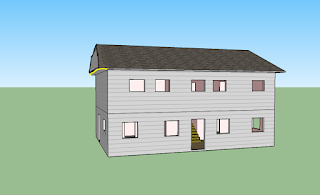 Once I start the frame up there is going to be some shifting around of the lines, the stairs are moving over about 2' so even out the upstairs, which will give a bigger bedroom downstairs, and a smaller pantry area, though I may shift a few other details, to give more pantry room. The mechanicals will be presented in this design, as they have not been in others that I have drawn. In addition to plumbing and HaVAC, I will be presenting electrical and other details like the low voltage systems, smart home details, and even safety and security details. I think I am going to look at a geo-pump and radiant floor heating, plus gas heaters, so this will be quite a bit more ambitious design. At 36' x 24' this is quite a large house for me, much bigger than I usually design. This is a 1,7282 foot home, which is ginormous for my usual designs. I would like to cut it down some, but for the sake of the design as I saw it, this is going to work as it is. It is very simple and the first floor is very open, with a very large staircase, under which is storage for the master bedroom. In addition to that, the front of the staircase can be opened so that can be used for some mechanicals that need to have a central location, like distributors for the in floor radiant heating. On the second floor I am using propane or natural gas heaters, though I am not certain what type yet, I am still considering that. The second floor heaters will be supplemental heaters as between the radiant heat, and the geo-heat I might not need a central heating system as is usual in house such as this. I am still working out the thermodynamics of the envelope to determine what will work best. There will not be an air exchanger or forced air, so if anything it will be a boiler on the first floor, as that is where the radiant heat system is, and that will also be used if the Geo-thermal heater does not produce sufficient heat. This plan should be usable in most areas, even where extreme temperatures are. In areas of higher heat a heat pump could be used in place of or in addition to the Geo-thermal pump to cool the interior. Well time to get back to work so I can begin to get the foundation details done, and I will try to publish that as soon as I get it done.